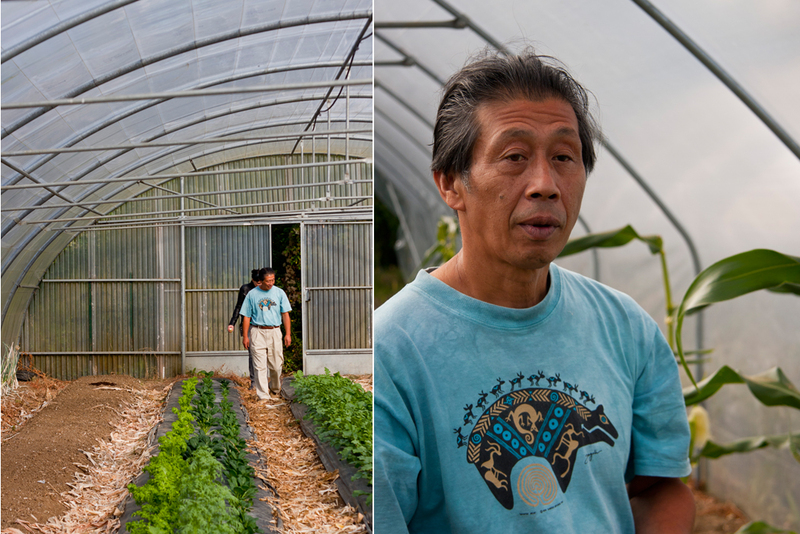 Asafumi Yamashita is not your average French vegetable grower. Firstly, he’s not French – he’s Japanese; and his clients are not your average grocers, retailers or restaurateurs. Yamashita can count his current clients on less than two hands – three-starred hands, in fact. 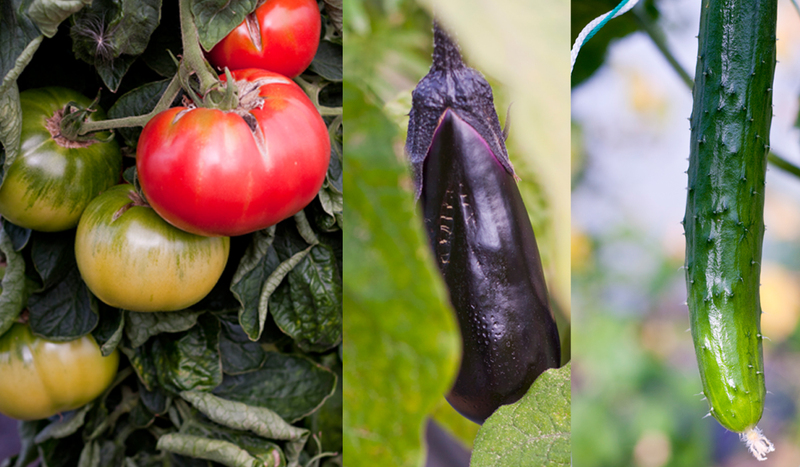 Yamashita is the select vegetable supplier to top chefs such as Pierre Gagnaire, Sebastien Bras, Sylvain Sendra, Pascal Bardot (l’Astrance), Eric Briffard (George V) and Anne Sophie Pic (Maison Pic), but don’t quote me on the currency of which of these are on the list at this moment. What’s even more interesting, however, is Yamashita’s personal story behind how this came to be. 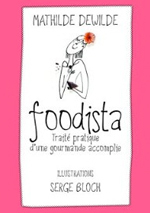 I first met Yamashita when I was on the panel at Haute Cuisine Paris. 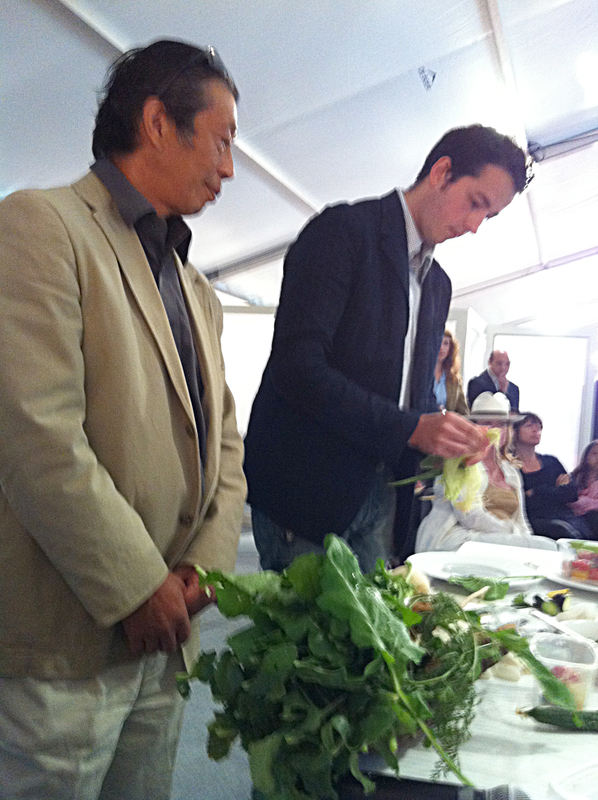 Yamashita gave a demonstration and tasting of his exotic Japanese vegetables along with chef Sylvain Sendra from Restaurant Itinéraires. It was that day when I first tasted the sweetest, juiciest raw corn that had ever passed my lips, and the intriguing texture and flavour of his trademark vegetable, the Kabu – something I describe as in-between a daikon, zucchini and a green apple. More importantly, chatting with Yamashita that day was when I discovered his personal story. Yamashita first came to Paris 24 years ago. At the time he was a bonsai artist and made a modest living from selling his bonsai trees. One fateful day, all but one or two of his Bonsai trees were stolen from his property. Left without his valuable assets for the bonsai business, he turned to his other hobby, for which he had natural gift – growing vegetables. 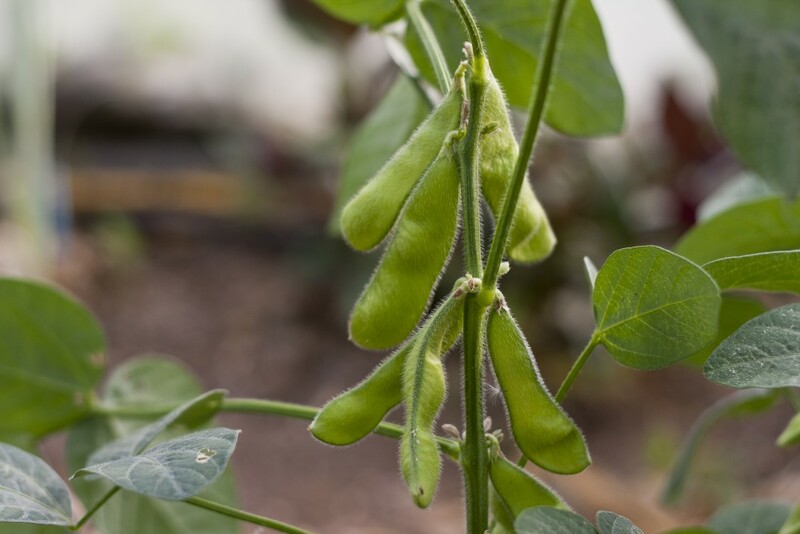 With all but a green thumb, a few packets of dried seeds brought from Japan, and a handful of existing plants, he slowly built up his vegetable garden and started supplying local Japanese restaurants in Paris and surrounds with hard-to-find Japanese varieties. Eventually, his niche supply of top quality, seasonal Japanese fruits and vegetables caught the attention of the country’s best chefs, and now, 17 years later Yamashita has gained somewhat celebrity vegetable grower status amongst the ranks of France’s greatest chefs. 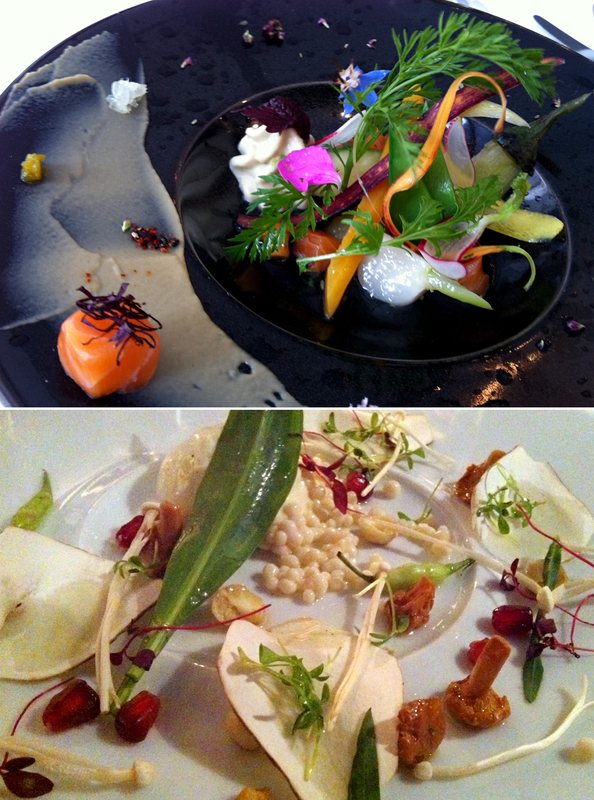 So it was with great curiosity and anticipation when I finally went for “La table d’hôte de Naomi et Asafumi Yamashita” experience at his farm in Chapet after scoring the last reservation of the season thanks to a last minute cancellation (the waiting list can be up to 2 months in advance). 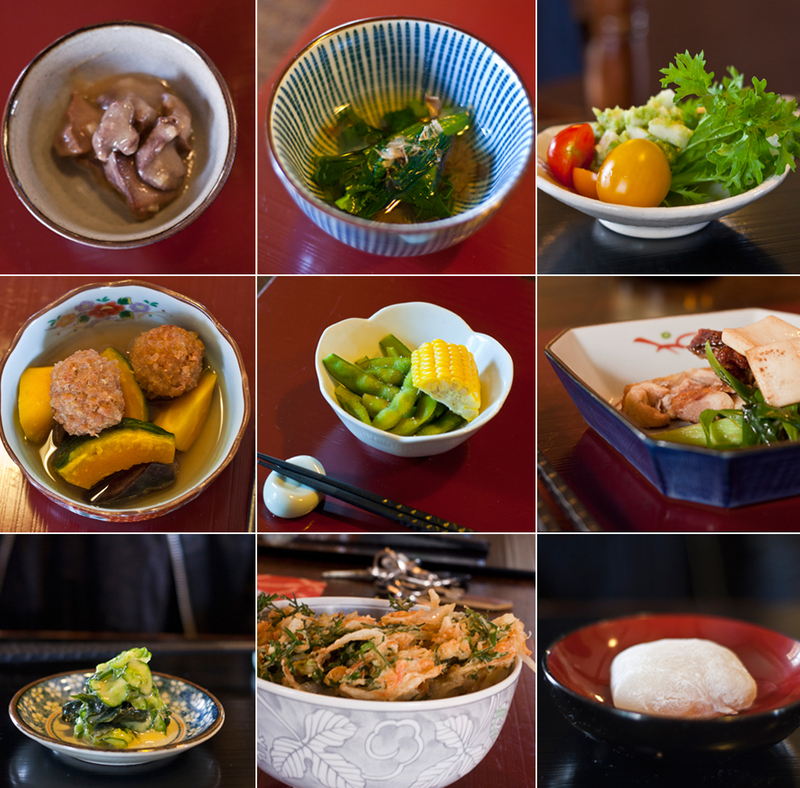 Yamashita and his wife offer a traditional Japanese degustation lunch or dinner nine months of the year on their homestead property in Chapet, 40 kms West of Paris. 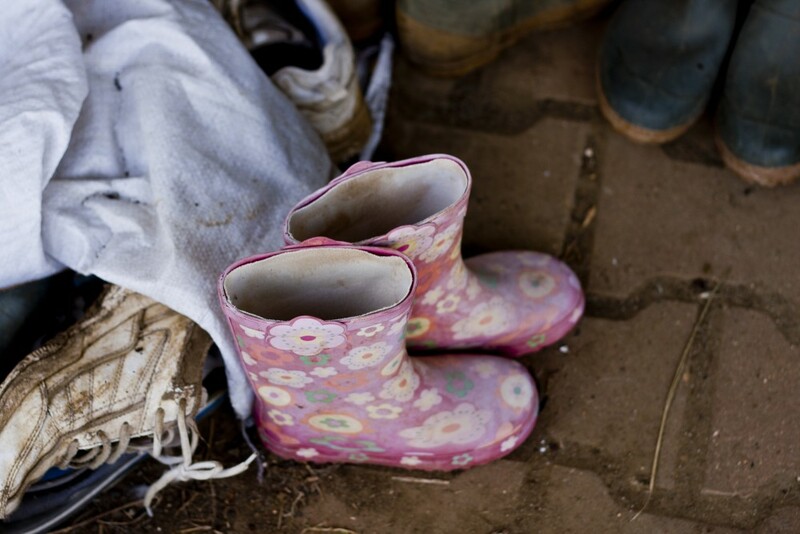 The food served is sourced almost exclusively from their own farm, so it’s as authentic, fresh and local as you can get. 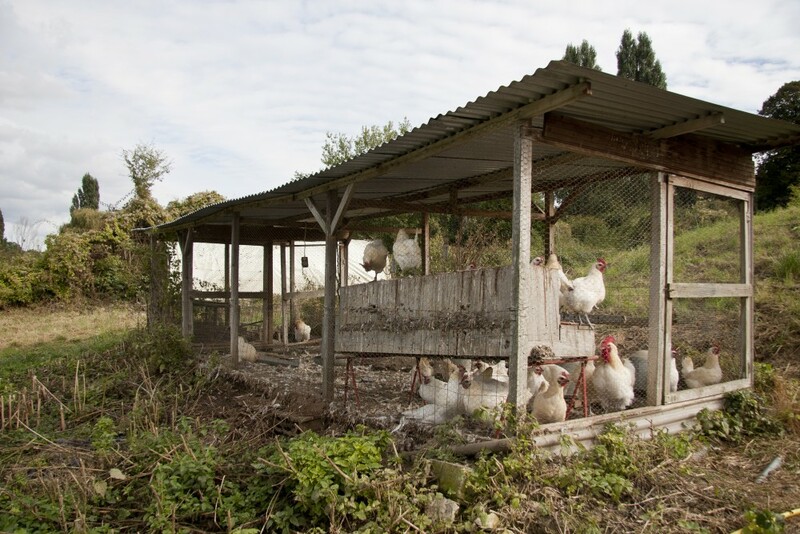 Yamashita’s farm is not certified organic, nor does he think all that highly of the concept. He makes all efforts to avoid pesticides and chemicals but is very upfront about the challenges and realities of growing quality small-scale produce to meet his client’s demands on consistent supply and quality. 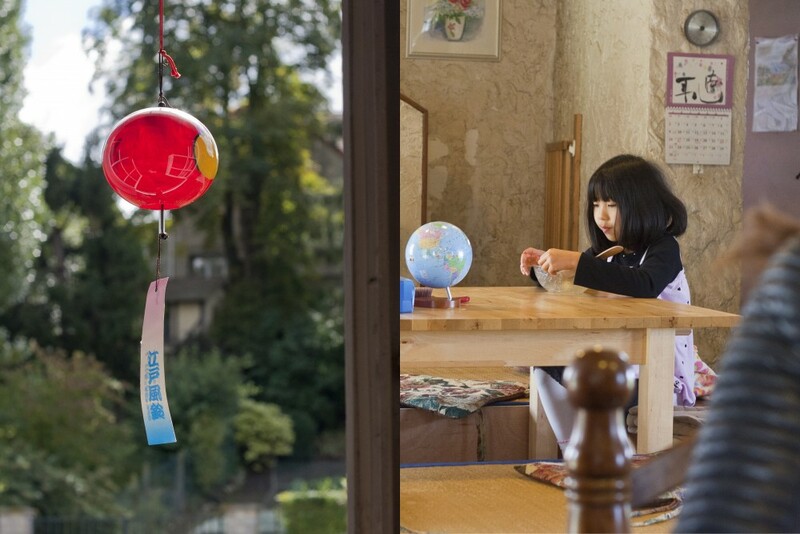 Yamashita is a modest, simple, yet switched-on, charismatic and passionate character. He personally served the ten guests at our lunch table each course, explaining in detail the produce and ingredients used. Luckily for me, I had brought along my friend Phoebe, who just happened to live in Japan for 12 years, so with her fluent Japanese we got even more out of the experience, including a translation from Japanese to English of one of Yamashita’s recipes (below). Surprisingly, most of the other guests at our table had never before eaten food of this kind – real, home-style Japanese cooking, I mean. In reality, I shouldn’t be surprised about this. The majority of Japanese restaurants in Paris are actually under Chinese ownership, and they offer the standard sushi, sashimi teriyaki menu you see everywhere. 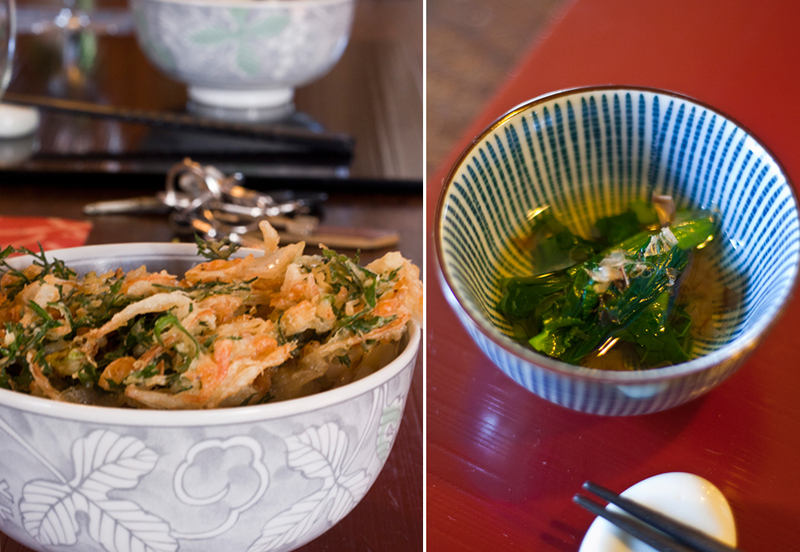 Of course there is authentic Japanese to be found in Paris, but it’s rather hard to come by. The French sure do French cuisine well, but I have to admit, they have a long way to go on offerings of ethnic and Asian cuisine. So when a table of self-confessed French foodies– most of them from Paris and surrounds admitted to never eating wakame, dashi or tofu before, we can understand why. The food is not fancy, it is super fresh, modest and designed to make the produce itself the star – presented and served simply with a thoughtful progression of flavour and complexity throughout the courses. I personally was totally stuffed by the fifth course, and had not even eaten managed to get through those in entirety. The chicken liver and heart dish we started with was not something I could stomach, and by the time the udon arrived, I was ready to lie down and sleep in the greenhouse next to the kabu. Everyone else at our table had no problems polishing off the entire 10 courses however… I’m forever impressed by how much French people can eat. 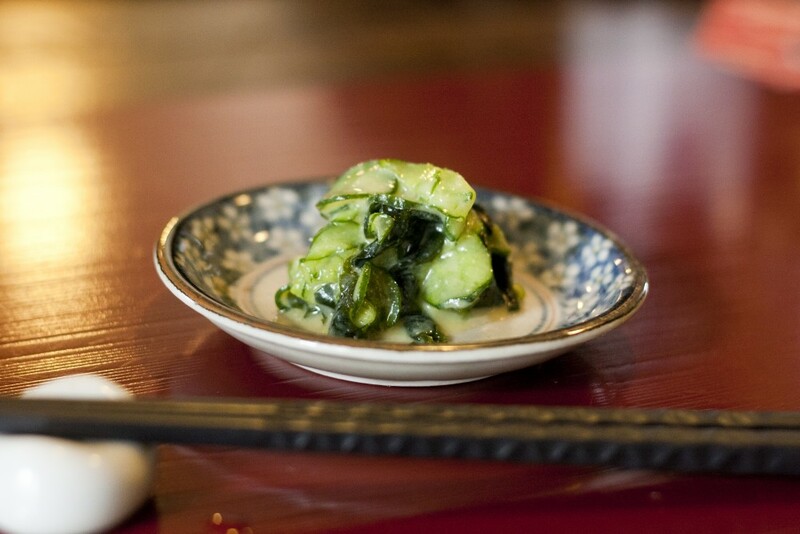 My favourite dish was actually the simplest – a gorgeous, small side dish of cucumber wakame miso pickles. Thank you to Yamashita and his wife Naomi for generously sharing the recipe below. You can visit “le Kolo” communal table for lunch or dinner on weekends only, outside of the winter months. 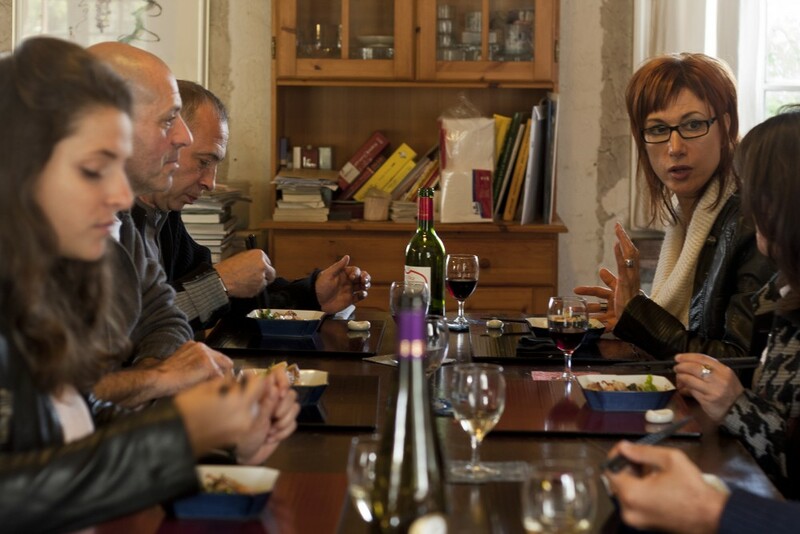 The price per head is 40 Euros for lunch, 50 Euros for dinner, plus wine. Come prepared with a big appetite, an open mind, expandable pants, and preferably in a car. For the more adventurous types, Yamashita offers the chance to try raw sashimi chicken at your meal… but you have to “pre-order” it two weeks in advance. Enough said. 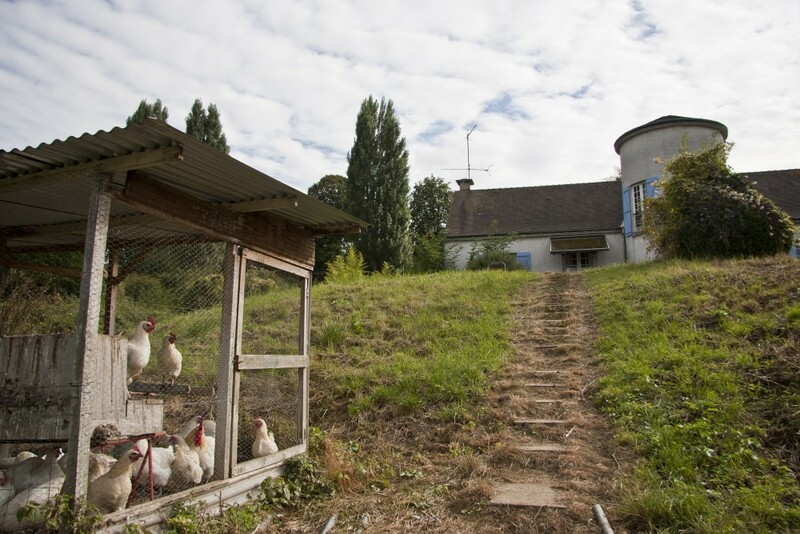 Nearest transport: By train: Gare des Clairières de Verneuil (from Gare Saint-Lazare, take 31 minute train MALA in the direction of GARE DE MANTES LA JOLIE, €6) then walk 15 minutes through the Bois de Verneuil to reach the farm. Rehydrate dried wakame in a bowl of warm water and drain well. Shave cucumbers with skin on, into long thin strips, preferably using a mandolin. Sprinkle sea salt generously over the cucumbers and allow to “sweat” for approximately 10 mins. Rinse the cucumbers to remove excess salt, squeeze out excess water and then pat dry with paper towels. 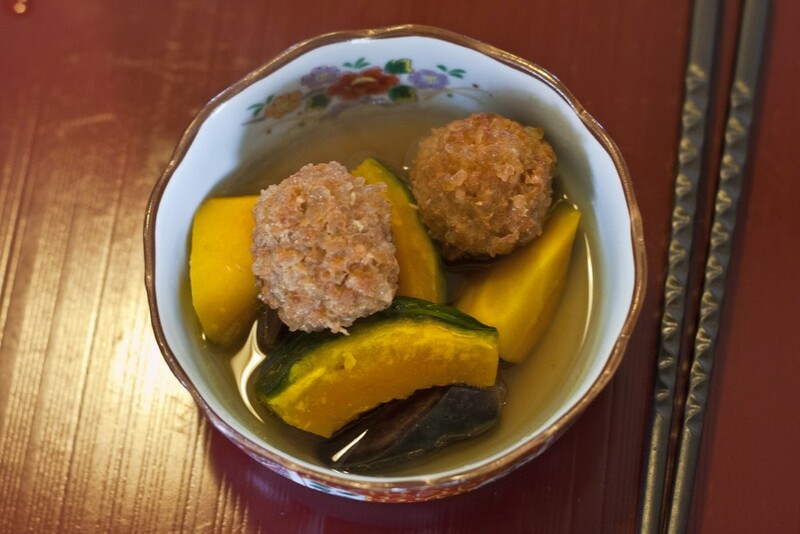 In a small bowl, mix the miso, egg yolk, vinegar, sugar and mustard until dissolved and well combined. Combine wakame and cucumber, then pour over sauce and mix in the dressing. Recently I had the honour of being invited as guest on the “Gourmet Jury” at the First Haute Cuisine Paris gastronomy event in the gorgeous Palais Royale Gardens. 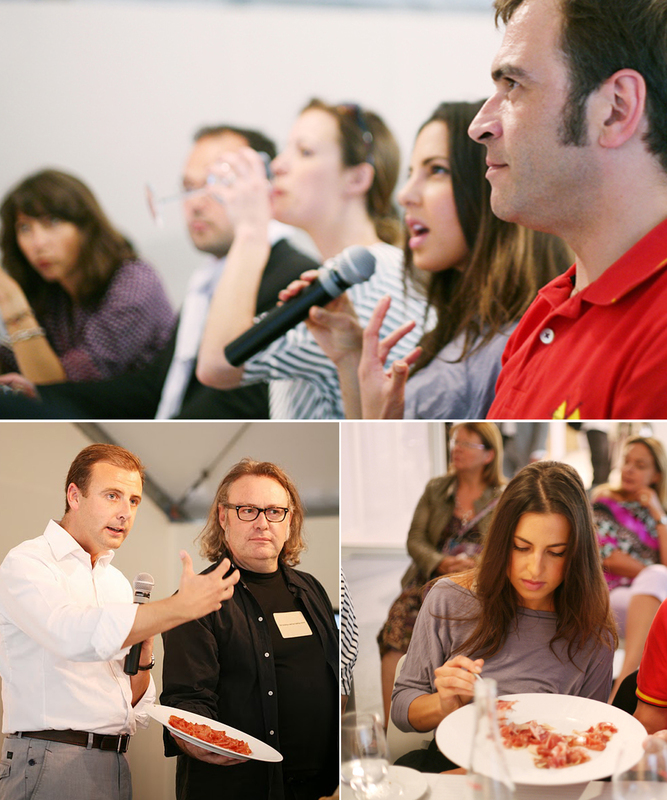 Over two days I sat on a gourmet-jury style ‘tasting panel’ organised by Madeline Market, where I had the pleasure of discovering some of the finest, freshest and most innovative products on French gastronomy scene. (What a dreadful way to spend a weekend… ) These two days opened out a whole new world of flavours, products, cooking techniques, trends and personalities that I figured are best shared with other food lovers, rather than left as memories in the form of photos on my iPhone and jotted notes in my little black notebook. In this post I summarise and feature the highlights and most noteworthy of my delicious discoveries, from the finest Ibéric Jambon with a nutritional lipid profile comparable to olive oil, through to an exotic Japanese Turnip, exceptional Italian Carnaroli Rice and incredible micro-herbs that literally explode on your tastebuds. Here I aim to be your ‘French Food Correspondent’ in sharing these delicious discoveries. This is the part where I add my little disclaimer to confirm that none of the references in this post, (or on my blog for that matter) are of a commercial nature. I like to promote people and products simply becasue I think they’re great, not because I’m paid to do so. Voila! ‘Jamon’ variety Ibéric Jambon from Origine Gourmet (Patte arriere du cochon). Day one was all about Jambon. I must say, when I was first asked to sit on a panel purely involving the degustation and discussion of Ibéric Jambon, I was admittedly a little intimidated. For someone who had spent a large portion of her adult life as a vegetarian, the invitation was both exciting and slightly daunting at the same time. My former choice to lead a vegetarian lifestyle was what I believe originally contributed to my passion and curiosity for food from an early age; but the main drivers were the ethical, animal rights and environmental sustainability issues linked to the meat industry. Little did I know, man did not make all Jambon equal. Many of my generalised preconceptions of this product were dispelled through the discovery of this premium, artisanal Ibéric Jambon. Meeting Pierre-André, founder of Origine Gourmet was a big eye opener. 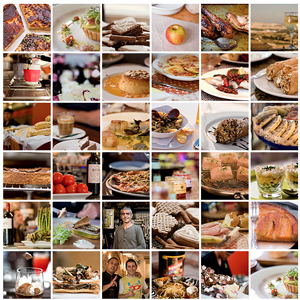 This man is on a mission to source and distribute the finest range of gourmet delicacies produced with the greatest respect for terroir, tradition, quality, and artisanal farming techniques and methodologies. We sampled four kinds of Ibéric Jambon on the jury, each was a unique discovery in itself- exhibiting its own distinct personality and flavour profile. Tasting a fine jambon of this quality is a sensory experience on so many levels. On the palate, it not only apports an incredible array of subtle flavours ranging from red fruits, vanilla and cinnamon to hazelnut, wood and truffle, but it brings one of the strongest sensations connected to ‘terroir’. At the moment of tasting this jambon- you really get this feeling of being magically transported to the place of its origin. An unexplainable connection between the product and the land, was produced from becomes evident through the aroma of earth, truffle, soil, wood, and fruit. I’m also convinced that the strict production methods employed in producing these special products is at the heart of this. 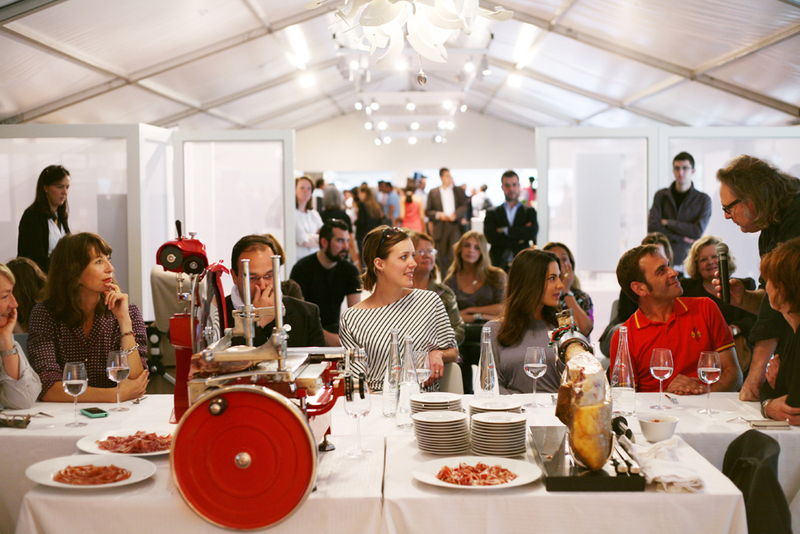 The ‘Jamon’ variety for example, (pictured) requires up to four years of careful treatment, processing and ageing following strict traditional and artisanal methods, before the product is finally ready for the market. 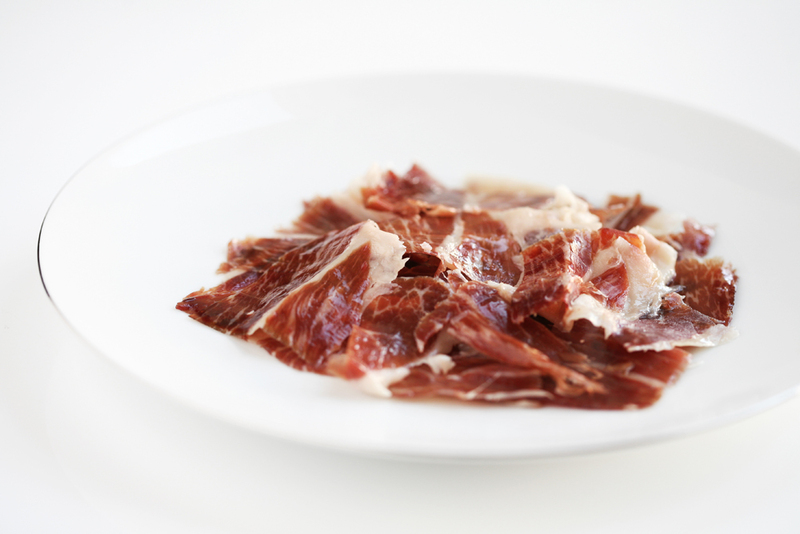 Salted for up to 15 days at a constant 5 degrees, then temperature controlled for a further 60 days at 80-90% humidity, the Jamon is then matured during a careful drying process which ensures the gradual and uniform diffusion of fats into the fibrous tissues. The maturation process lasts up to 9 months at 30-35 degrees at 70% humidity with the entire process controlled daily by a “Maesto Jamonero”. Finally the maturation is completed in special ageing caves which allow a natural constant temperature of 10-20 degrees at lower humidty, where the Jamon matures for 20 to 30 months when finally, at the end of the long process, the moment arrives when the Jambon becomes “Jamon”. Aside from the slow, strict artisanal maturation and treatment process, almost more importantly is the story behind the original product- the actual animal that was raised under the most ideal of living conditions and with great respect for the health, well-being, happiness and physical state of the creature during its lifetime. The ‘Ibérico’ Cochon is a specific breed perfectly adapted to allow for cohabitation with other species- usually impossible with other varieties. Honestly, these animals have a pretty awesome lifestyle. For the first year and a half, they are raised in vast open enclosures that permit the farmers to have a greater degree of control over their diet. Come October, they are released completely into the wild where they graze at full liberty in oak forests and dramatically increase their body weight until 60% of their body fat percentage is composed of fat tissue. Roaming and grazing with reckless abandon in bountiful open spaces sounds pretty good to me. The ‘sacrifice’ of the animal is obviously an important part of the process and is carried out in a manner observing the utmost respect for the creature, and in the most humane way possible. Finally, each portion of the cochon is used to produce one of four uniquely different types of Jambon: Paletta, Jamon, Lomito and Lomo. Furthermore, all of these utopic conditions bring specific health benefits to the product: Nutritional profiling studies on this Ibéric Jambon reveal large antioxidant properties and very high levels of Vitamis B1, B6, B12 and Oleic acid (Omega 9)- the cholesterol-lowering substance normally found in olive oil. Pas mal. And the price, you may ask? Naturally, due to the highly idyllic conditions involved in all of the above, the Ibéric Jambon is sold for between 180 € and 450 € per kilo. It recently became available for order online with international shipping on Madeline Market where you can buy it in 100 gram packs staring from 18 €. Passion for quality- Pierre André Rouard and Jean Bernard Magescas. Trying to explain the subtleties of terroir and Ibéric Jambon... in French.. not easy! During day 2 on the Gourmet Jury I discovered the fine, exotic Japanese vegetables of Asafumi Yamashita. 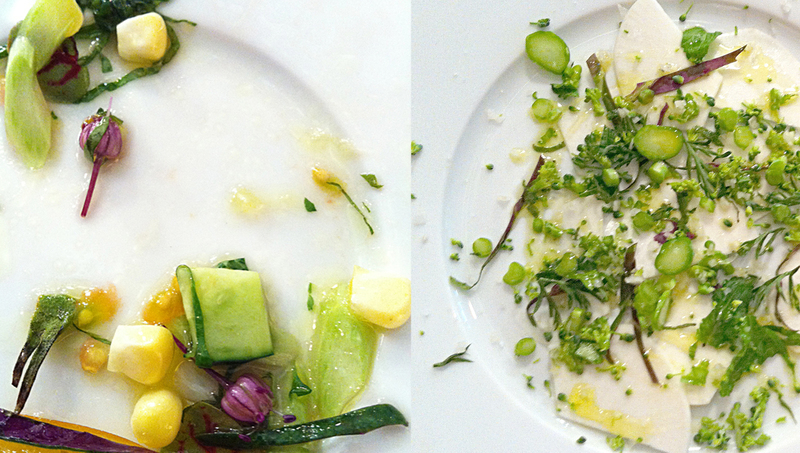 I never imagined myself getting so excited by a pretty plate of diced raw vegetables, but the result was what I imagine would occur if Monet, Marimekko and Louis Vuitton threw a party in a veggie garden. Yamashita could honesty transform a hairy celeriac root into a plate of art with a few simple flicks of his Samurai grade vegetable knife and the elegant gestures of a skilled calligraphist. Yamashita – a Japanese expat who moved to Paris more than 36 years ago to study French at La Sorbonne; through a turn of fate, fortune and pure talent has become somewhat of a French celebrity gardener. His story is both fascinating and inspiring. Originally Yamashita was a practicing Bonsai artist when he first set himself up in Paris, until one fateful day when nearly all but two or three of his Bonsai trees were stolen. 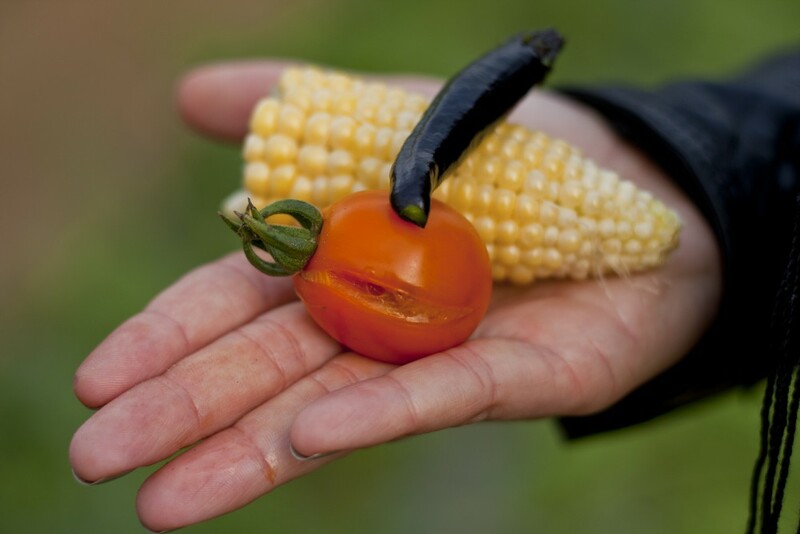 Unsure of what to do next, he turned to his other passion and natural talent- growing vegetables. Notably, there is one thing these two beautiful artisanal crafts have in common – the artful gesture (which really does sound much nicer when the French say it as “le beau geste”). Before long, Paris’s top Michelin-starred restaurants were practically fighting over access to his limited supply of rare and exotic vegetables; all carefully cultivated personally by Yamashita on his own farm and hand delivered in person twice a week to a very select number of top restaurants and hotels. Today Yamashita’s impressive clientele list includes le George V, l’Astrance, Ze Kitchen Galerie and Restaurant Itinéraries (one of my favourite tables in Paris). Yamashita and Sylvain Sendra- head chef of restaurant Itinéraires, united produce and passion to prepare a selection of vegetable assiettes for the Gourmet Jury. The simple manner of preparation, cutting techniques and insanely fresh, quality nature of the produce itself created sheer delight. I have never tasted fresh corn so sweet, crisp and starch-less in my life… special varieties of fresh Broccoli, cut separately to distinguish the flavour and texture of the stem, leaves and florets… rare Caviar Tomatoes, Red Carrots, Kabodjian Pumpkin, Japanese Herbs and one star vegetable that stole the show: “Le Kabu”. The Nobel Prize of Root Vegetables goes to this incredible variety of white Japanese turnip (pictured on brioche and jam above). We tasted this impressive variety both simply sliced raw (visible on the base of the vegetable assiette on right) and also whipped up by chef Sendra in a surprisingly delicious combo with Brioche and confiture (fruit jam). 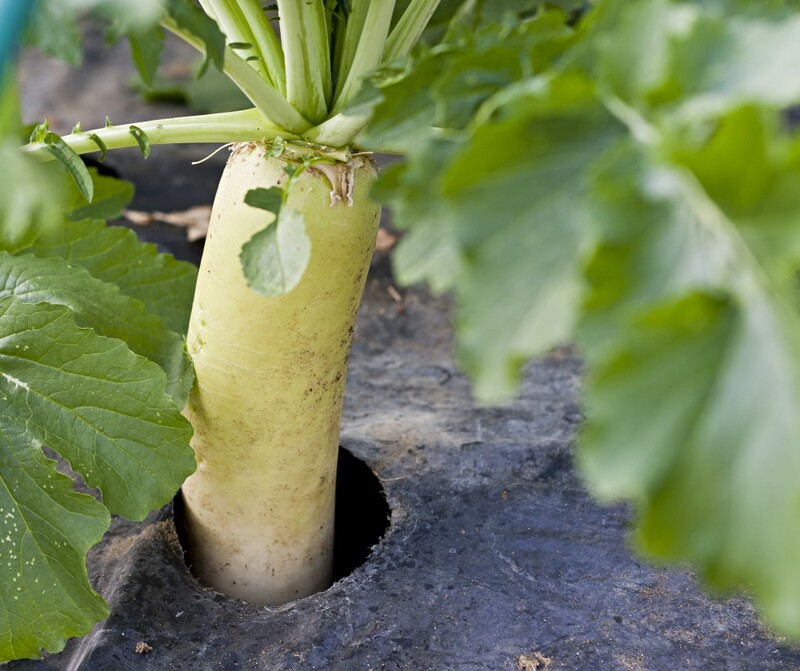 Let’s face it… turnips are normally such an unsexy vegetable. But the Kabu is no ordinary turnip. Unlike the turnips I am accustomed to (and generally not a fan of), the Kabu does not exhibit bitterness, starchy character or a dense fibrous texture. Its exterior is soft and slightly spongy, the interior flesh is delicate and refined with a slight apple-ish sweetness and the density is somewhere between the crunchiness of carrot and soft sponginess of a raw zucchini. When in season, Yamahita produces up to just 300 per month. Unfortunately, supply of Yamashita’s exotic delights is not available to the general public, so if would like to sample Yamashita’s produce, you have one of two options: either dine at one of the restaurants he supplies, or reserve well in advance for the real deal- a long lunch in his very own on-site garden restaurant where you can visit the farm and sample his produce over a delightful ‘discovery degustation menu’. Have you ever wondered how many of today’s top chefs manage to pack so much flavour and subtlety in their creations whilst keeping them perfectly well garnished and stunningly presented? 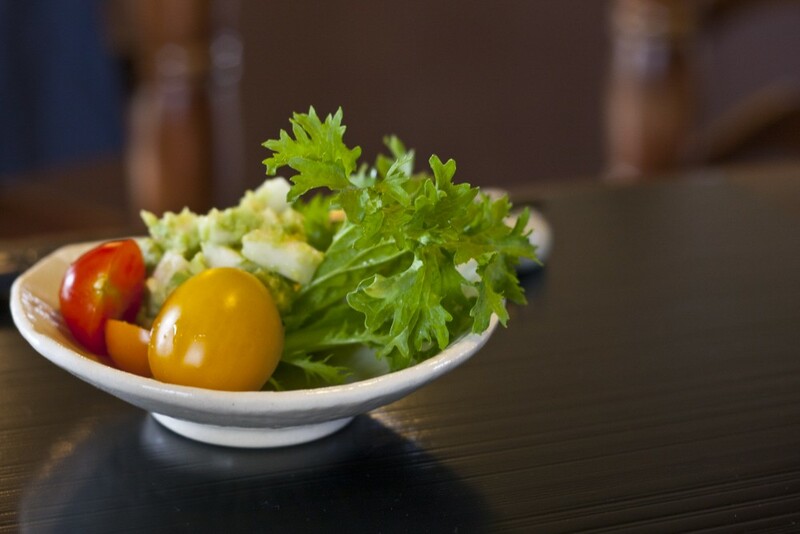 Slowly I am discovering some of their tricks, and one of the secrets lies in their access to and clever usage of a commercial range of micro-herbs and specialty ‘Cresses’ – fast becoming big business in this industry. 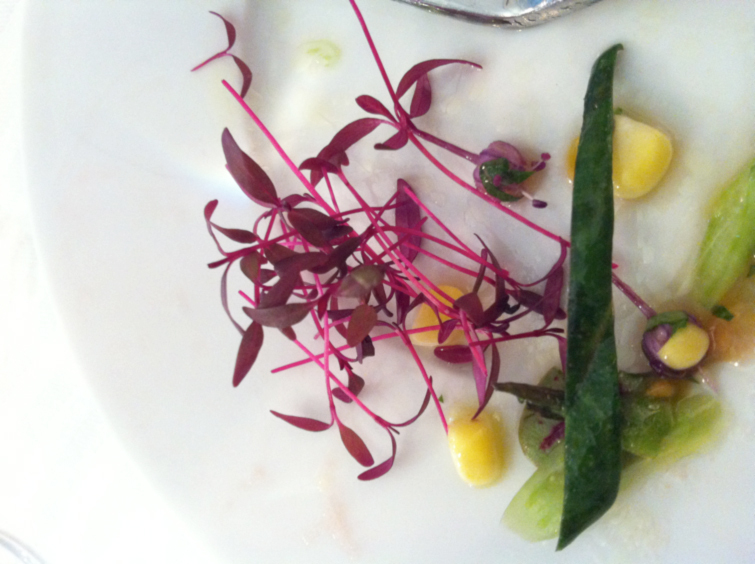 On the Gourmet Jury we tasted a wide range of these tiny, delicate ‘mini cresses’, flowers and micro-herbs supplied by Koppert Cress. The range across these special products is just overwhelming. I had never been exposed to such a diverse array of products like this in Australian restaurants to my memory, so for me it was a real eye-opener. 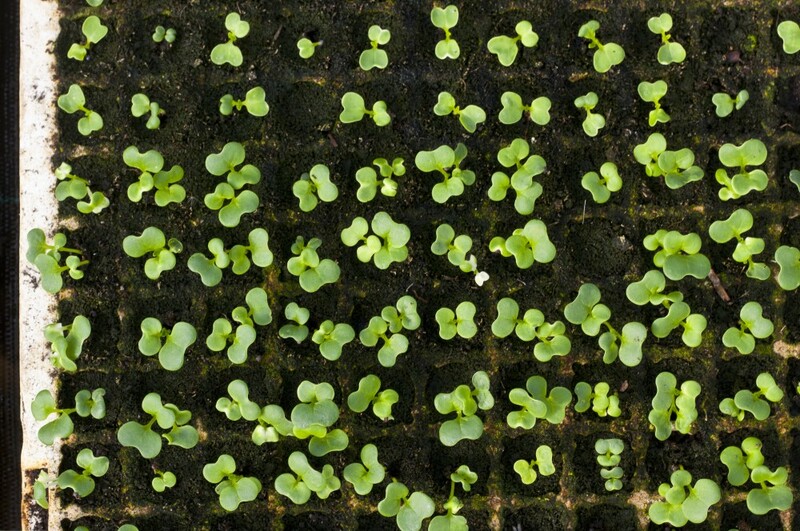 Limon Cress – (Pictured) From the basil family, this powerful leaf has strong aniseed and lemon character. I have seen it used in restaurants to flavour sorbets and garnish fish. 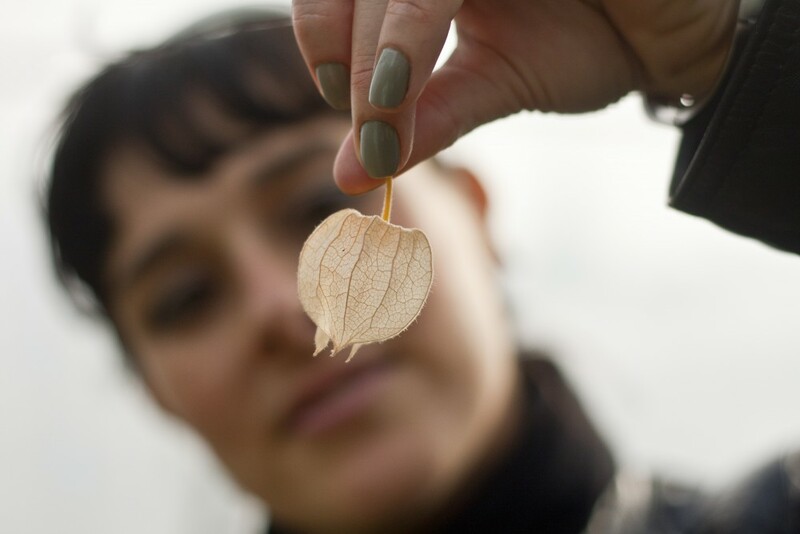 Salty Fingers– A plant grown along the coasts of tropical America and Asia. It’s crispy, salty, slightly bitter with a cactus-like texture. Sechuan Buttons – These inconspicuous little yellow flowers are seriously feisty and create more of a ‘sensation’ rather than flavour experience. Thank goodness that was the last one we tried- my tastebuds were on fire and completely out of action for a good 20 minutes after that little piece of dynamite landed on my tongue! 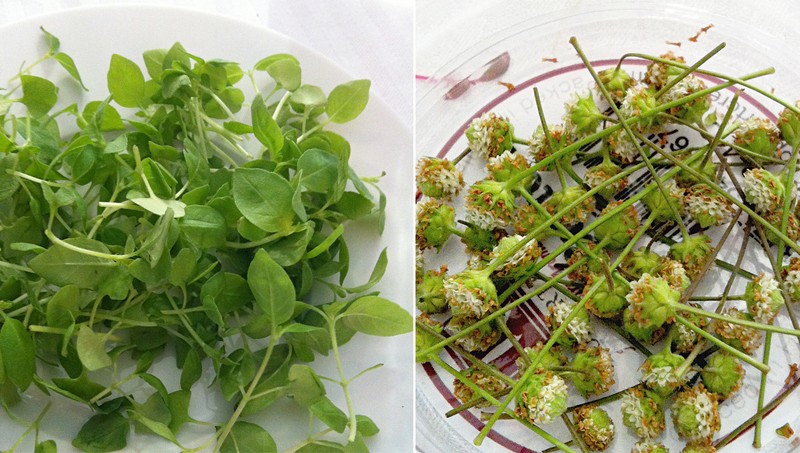 Incredible Cress: Limon Cress (left) is packed with aniseed and lemon flavour. 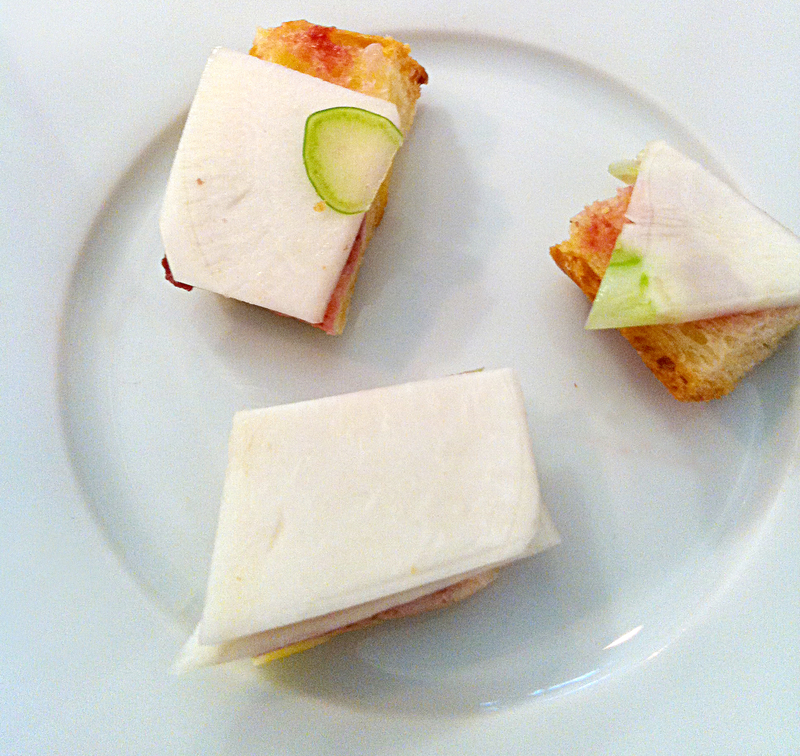 Now, what food event is complete without something fine and Italian? No, I’m not talking pasta, or cheese, or Italian dolci- this time it’s Italian rice. In the end, I did try this rice, and really, I was blown away. I love it when something so simple is just so darn good. 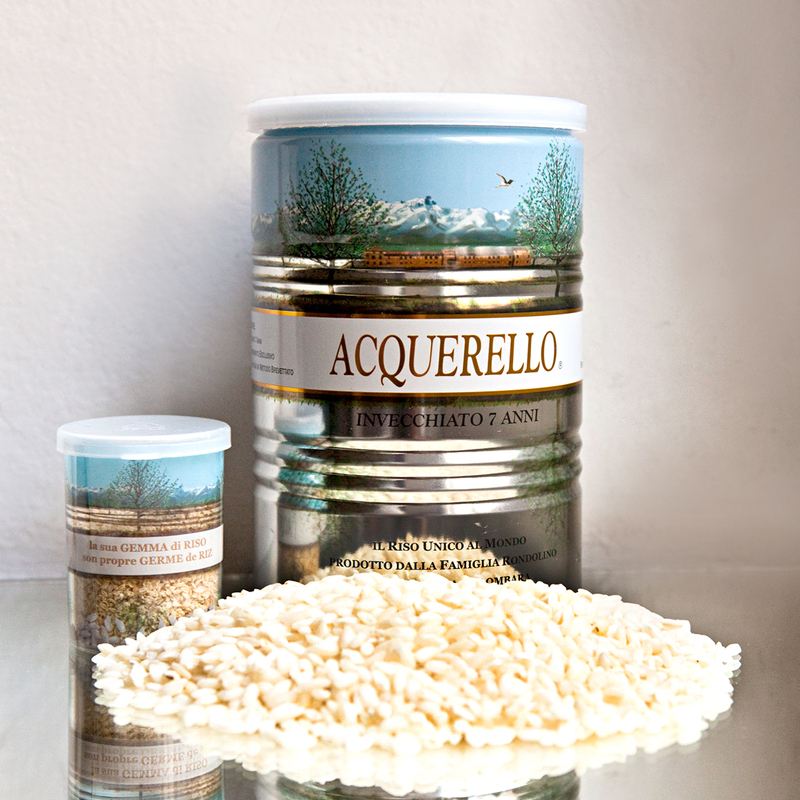 This special variety of Italian-grown and produced rice grain called “Carnaroli” by Acquerello was cooked using the absorption method, with a little olive oil and sea salt for good measure- and that was it. I would have been happy to eat that as my lunch for a week straight- honestly. This special rice is grown, aged and processed on the 16th Century Colombara farm by the Rondolino family in northern Italy. They use a patented whitening process whereby the unhusked whole rice grain is aged for at least one year then slowly and gently whitened using a helix then restored with it’s original rice germ. The end result is this superior product that retains the nutritional profile of brown rice but cooks similarly to Arborio – staying perfectly intact without losing starch or vitamins. I made a risotto with it recently (guided by the expert instruction of an Italian friend of course) just to test it out myself, and the results were superb. (Check out the risotto we made here). Acquerello Rice. Not just ordinary rice. 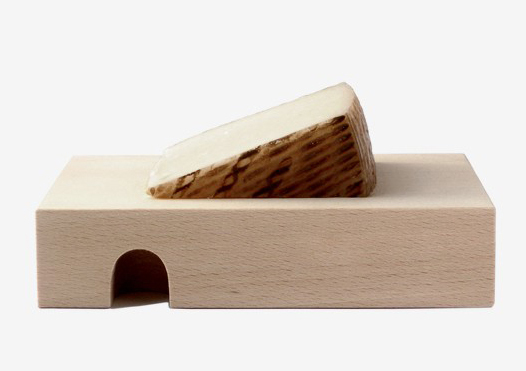 Now finally, you have probably noticed by now how much I love CHEESE so I just couldn’t go past this gorgeous creation by designer Sebastian Bergne who exhibited his “Eat & Drink” table-wear range at Haute Cuisine Paris. No kitchen is complete without a good cheese board, and besides, you need to order one to go with the cheeses you can smuggle through the French border, next time you’re in town. 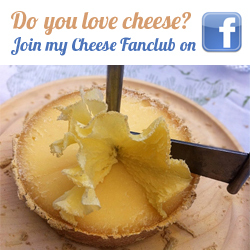 Coup de Coeur - Beechwood 'Jerry' cheeseboard. The understated elegance of Sebastian Bergne design. One of my favorite city havens. 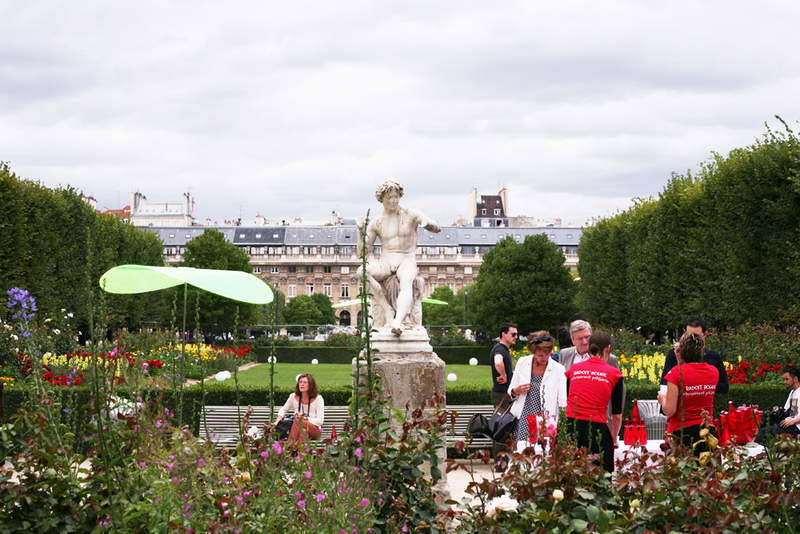 The gorgeous gardens at Palais Royale, Paris.